This weekend was one of the few times my “real” job intersected with my food blog. I had the distinct pleasure of making a few dishes for a Thanksgiving potluck hosted by one of my colleagues. 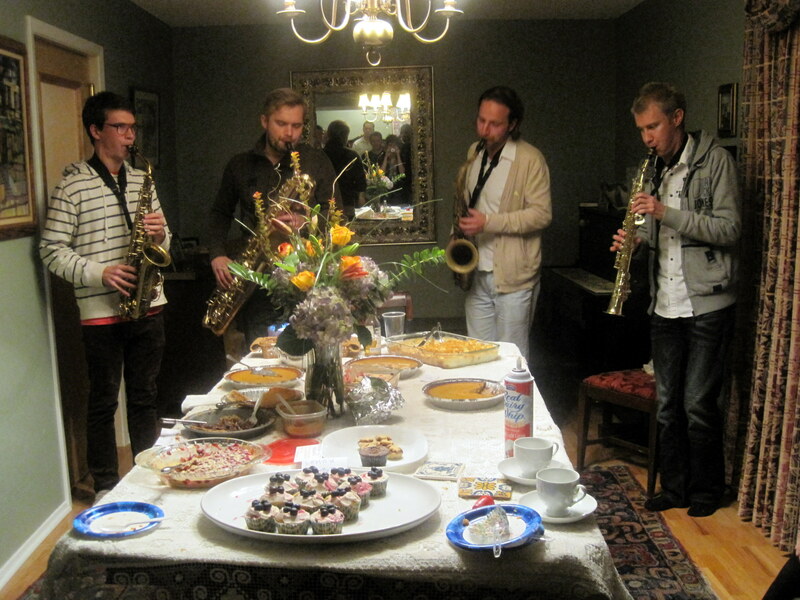 He hosted the party in honor of a visiting saxophone quartet from Helsinki, Finland. This meal was the quartet’s first-ever American Thanksgiving, and I made a sweet potato pie and these adorable apple persimmon pies to share with our visiting friends. I originally planned to make a large, double crust American apple pie. However, I just couldn’t resist the persimmons at the farmer’s market last weekend, so into the filling they went! Since this recipe was still in the testing process, I elected to make mini pies instead of one big one so that I could sample the finished product before the potluck. I’m happy to say the little pies were a big hit at the party. The leaf-shaped top crust looked very sweet on the buffet, and the intense flavors of the pie filling worked better in small bites than they would have in a big pie slice. After dinner, the quartet gave an impromptu performance in front of the potluck dessert spread. You can see that my mini pies were in good company: besides the musicians, there are seven pies, a noodle kugel, two kinds of vegan cupcakes, and two kinds of whipped cream around the dining room table! 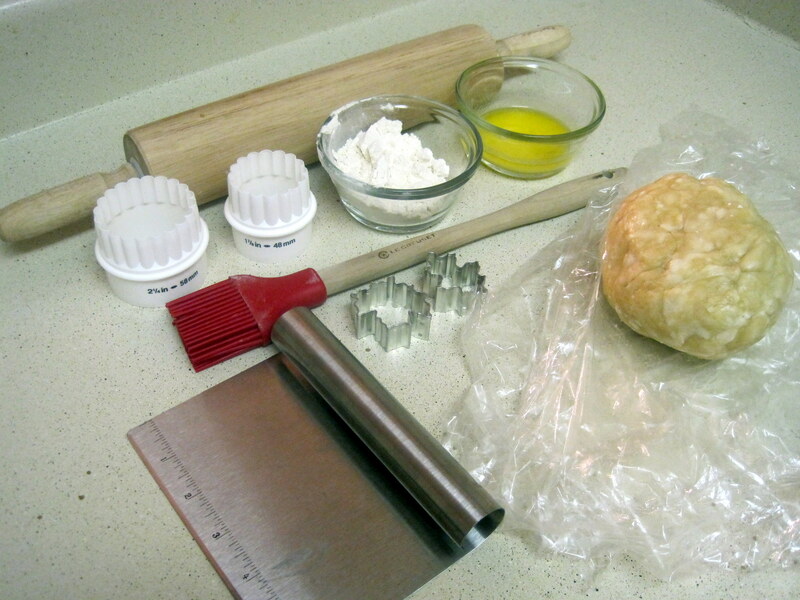 Below are step by step instructions for making the mini pies. I filled them with apple persimmon compote but any compote, jelly or jam, or prepared pie filling would work. I do not recommend using raw fruit filling for mini pies; in the test batches I made, raw fruit cooked a little unevenly in the small pie crusts. Also, keep in mind that the fruit pieces for this recipe need to be very small. Any large chunks of fruit that extend above the pastry crust tend to dry out and burn. First, prepare pie crust. I have the best luck making vegan pie crust in the food processor. In the food processor, pulse flour and very cold shortening until shortening pieces are about the size of walnuts. Add ice water one tablespoon at a time, pulsing in the processor, until dough comes together in a ball. Once dough holds its shape, remove from the processor bowl and store, wrapped in plastic wrap, in the fridge for up to a week or frozen for up to one month. If you freeze dough, allow to thaw in the fridge for 24 hours before proceeding with recipe. Finally, it’s time to assemble the mini pies. You’ll need a rolling pin, pastry brush, bench scraper, mini muffin tins, 2 1/4 inch biscuit cutter or a drinking glass with that diameter, and mini cookie cutters in the shape of your choice. (I used leaf shaped cutters.) All these supplies are available in Austin at All in One Bake Shop. On a floured surface, roll the dough to 1/4 inch thickness. Cut 36 bottom crusts with a 2 1/4 inch biscuit cutter or glass and put the crusts in a mini muffin tin. Use your fingers to push the crusts firmly into the bottom edges of the muffin cups. As necessary, gather up crust scraps, smoosh them together and reroll them. 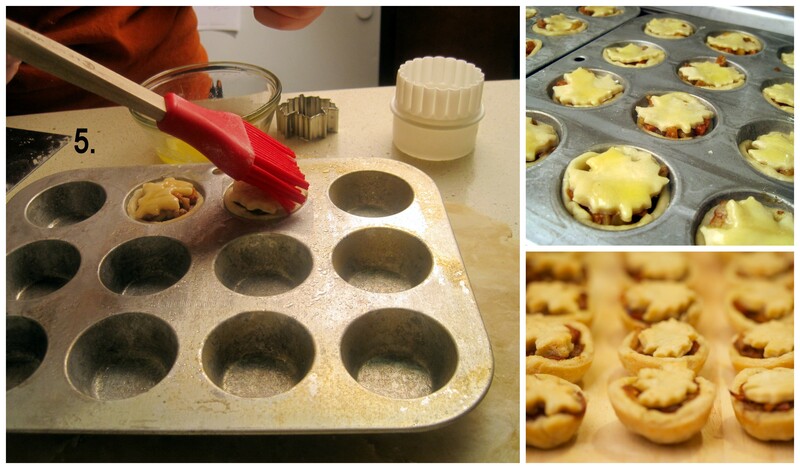 Fill the mini pies with 1/2 tablespoon filling each. Cut out the top crusts with a mini cookie cutter and smoosh them onto the top of the pies. Use the bench scraper as necessary to move the delicate dough shapes without stretching them. Brush each mini pie with melted vegan margarine. Bake in preheated oven at 350 degrees for 30 minutes, until crust is lightly brown. Cool in the mini muffin tins for 10 minutes before using a thin-bladed knife to gently lift each pie out of the tin to finish cooling. Do not store in an airtight container until completely cool; pies will get soggy otherwise. These mini pies stayed fresh overnight on my kitchen counter and tasted great at room temperature at the potluck. No need to garnish with whipped cream, etc. Since each pie is so tiny, it’s best as a stand-alone dessert. For easy potluck transport, place cooled pies back into muffin tins and transfer to a serving platter at the event. 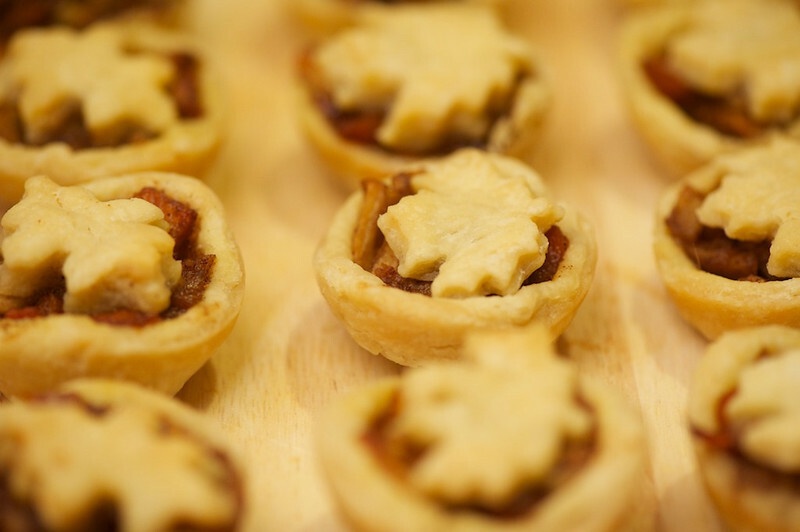 *Thanks to Nathan Russell Photography for taking pictures of the finished mini pies and for loaning me the tripod and light kit I used to capture the step-by-step images. This entry was posted in Desserts, Dietary Restrictions, Fruits, Vegan, Vegetarian and tagged Apple, Cinnamon, Persimmon, Pie, Thanksgiving. Bookmark the permalink. They look great! I know how much work it is to do mini pies but I’m sure they were worth the effort. Those look incredible. I’ve had little luck in the past with making mini pies, and it made me consider giving up on it. But I think I’ll give it another shot! Mason, you can do it! They are a lot of work, but so cute in the end. Good luck! Hope your Thanksgiving is a fun day of food with friends and family.